When it comes to recognizing a potential bargain at a Flea Market, antique store or auction house, nothing beats having had to dismantle a chair or table for restoration purposes, analyze it’s parts, and then restore the piece using the same materials, tools and techniques used when the piece was made. Knowing how to use a chisel and handsaw and understanding the types of markings they leave behind is invaluable when trying to determine when a piece of furniture was made. To date a piece and distinguish antiques from reproductions or fakes, you need not just in-depth knowledge of historical styles and construction techniques but powers of deduction worthy of a detective. There are a number of questions you should be asking yourself when trying to determine a piece of furniture’s true age. What “style” is it? Did the decorative motifs match that given style? Was this type of furniture used during that time period? What species woods and veneers were used on the exterior and interior? How thick Is the veneer? (Rule of thumb…the older the piece, the thicker the veneer will be.) Are the insides of the drawers finished, or the outside back? (a common practice used on reproductions or fakes to hide the coloration of the newer wood.) Are there normal and logical signs of wear in the right places? On many occasions I have found myself evaluating a customers furniture, only to be shown a “very old and valuable” antique. “It’s very old”, Or “it’s a real antique” usually starts the conversation, followed by the story of how It ended up in their possession. 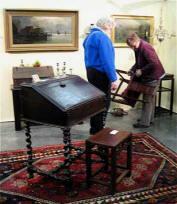 All to often, the “antique” turns out not to be an antique at all! So how can you tell? The antique dealer said It was a period Hepplewhite sideboard, and the price sticker would support that, so it must be an antique right? Not necessarily. Honestly, I approach every piece with skepticism. The truth is, for every true period antique, there are many thousands of reproductions. I look at every piece assuming it is not a period antique, and then use the power of deduction to make a final determination. Here are some simple things the every day collector can look for in order to help determine If a piece has real age, or if it may be a newer reproduction. 1) Pull out a drawer. Are the dovetails hand cut or machine made? If you don’t see hand cut dovetails, It’s a reproduction. Next I look at the drawer bottom. Is the bottom solid wood or laminated plywood. Plywood indicates it could be a reproduction. Also, does the unfinished wood “look old”? If the inside of the drawer is finished or stained….beware! 2) Next, look at the outside back. If It’s one piece of plywood, it might not be an antique (unless someone replaced the “real” back). Also, the outside back should not be finished or stained. 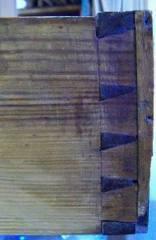 3) If you can see dowels anywhere within the construction….It’s probably not an antique. 4) If I am still not sure, I start looking inside the cabinet at the tooling marks. If everything inside the cabinet is smooth, I’d know it wasn’t that old. Sandpaper did not exist In the 18Th century, so on very old furniture there was no attempt to hide machine marks in unseen places. Look to be sure there are no “circular” machine marks. Circulating saws did not exist before the industrial revolution of the mid nineteenth century. These are just a few of the most obvious signs to look out for, but you would be surprised at how many pieces don’t make it beyond this checklist. Either way…If It’s beautiful or special to you….enjoy It !! !